You know the kind of book you resist reading, just because everyone else has been talking about it for so long that you're convinced you know everything there is to know about it? It's the way some people feel about the movie Casablanca, or the show Friends. Saw the preview, heard people rave about it, what's left to know? Yeah, that's how I felt about The Help. I was wrong. There is so much more to this novel than can be captured in the praise it has garnered. Set in Jackson, Mississippi in 1962, The Help takes place against a backdrop of Civil Rights and cultural change. Sit-ins and mini-skirts, marches and birth control: this is the dawning of a new era. Amidst this change, we hear the voices of three women, Aibileen, Minny and Skeeter, whose stories at once intertwine and yet remain starkly separated. Aibileen is a black maid with a specialty in rearing the children of white women. After decades of watching others' children - and following the death of her own son - she finds her normal complacency and optimism waning, steadily replaced by a bitter cynicism. Minny, Aibileen's best friend, is a mouthy, sassy maid who jumps from job to job after refusing to accept her place within a white household, all while struggling to raise five children and avoid the hand of an abusive husband. And Skeeter, the only white narrator Stockett gives us, is a recent college grad and about as rebellious as young girls got in 1962 Mississippi. Rather than longing for marriage, as her mother wishes she might, she longs for a career as a writer, and is willing to risk more than she can imagine in order to finally see her words in print. Each of these women is strong in her own way, and tackles the big questions of life - family, love, friendship, race, class - in her own way, but in turn, each is important. In a world in which they are meant to live separate lives, none could survive without the others. In this style, Stockett tackles big issues in little anecdotes. Perhaps that was the magic combination, what made this book so persistent in its popularity: serious issues, accessible style. Or maybe it is the tackling of heart-wrenching issues with an overarching theme of hope. Or maybe it was bringing a very human element to the historical detail we all take somewhat for granted. Whatever it is, it works. 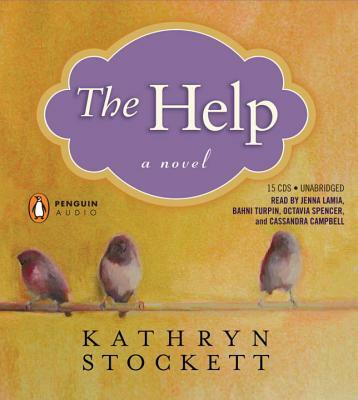 While maybe not the next To Kill a Mockingbird, The Help is well worth the read. The hype hasn't ruined it; if you're one of the few remaining people out there that haven't read this already, put it on the list. A note on the audio: The book is written in dialect, with each narrator speaking in her own voice. The audio version, which I listened to, is narrated by three women, and their voices capture the heart of their characters almost perfectly. Even know, flipping through the pages of the hardcover, their voices once again fill my head, Southern twangs and all. Though I'm sure the print is good, this is one instance where I recommend the audio over the print. I didn't enjoy reading the dialect at all. Even though I lived in the South for a decade, I found the dialect in this book to be contrived. I was thinking to try the audio and I will most definitely see the movie when it comes out. Dialect isn't so much a written thing - it's a spoken thing. As I've been trying to get into this medium, I have struggled with finding a good audio. I've only listened to two (finishing one right know - Ishiguro) that I've enjoyed. So I will definitely download this one - I've heard so much about the book and I think trying the audio version will be a good way to bring me into this story before the movie comes out! Got me! I'm one of those people who've avoided it, though not just because of hype but because it doesn't really interest me. As it turns out, it's now next month's book club choice! Trish's comment worries me a bit, since I typically find any written dialect kind of annoying. But I hadn't thought of the audio version! Thanks. Trish - I think the audio is a safe bet, especially if it was reading the written dialogue that was throwing you off of it in the first place. Coffee - Definitely! I find that for me, my audio picks have to be incredibly well-narrated (this one was), and plot-based. I love history, but I tried listening to a few histories on audios and just found I zoned out. I really enjoyed The Secret Life of Bees on audio, but there are two versions and one is definitely better than the other, based on the clip I heard of the one I didn't listen to in full. Steph - I'd avoided it, but was definitely glad I decided to pick it up in the end. And the more I hear about the dialect, the more thankful I am that I opted to listen to it on audio! Kerry... I downloaded the audio of this and LOVED IT!! Yay!! And I definitely would recommend the audio over the print version, too!